Once upon a time, not that long ago, when working with Navision, or should we say Navigator or perhaps Dynamics, the database was not SQL. It was a built-from-the-ground-up database specifically created for servicing an accounting system. Today it is known as the “Native database”. The latest version to support the native database was NAV2009. Born back in 1987, this database was a marvel of ingenuity. The SumField technology (flow field) and the versioning transaction system packaged together with awesome performance and ultra-high reliability made this a customer favorite for many years. (Irrelevant side note, the database was not a favorite amongst system administrators, because there were nothing for them to do with it, and it never broke down). 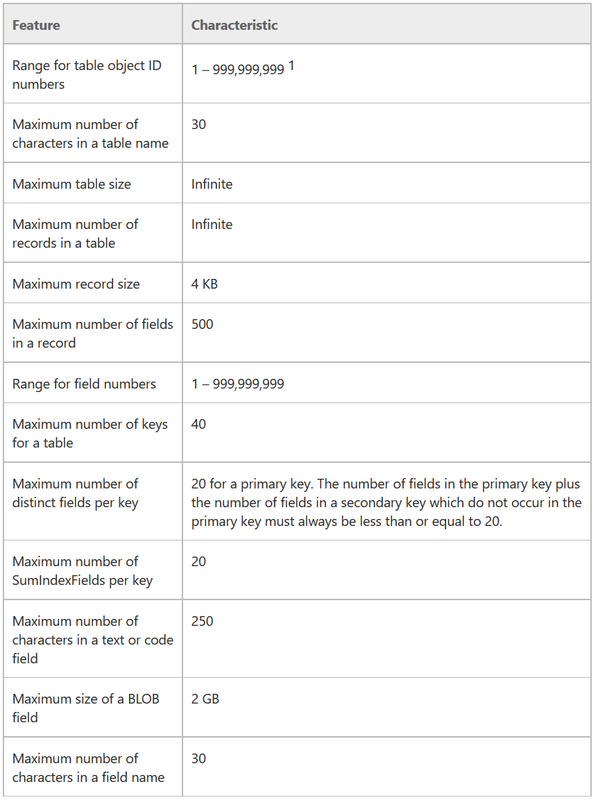 SQL Server has its own limitations, but they are nowhere close to this. So it seems like a “leftover” that Dynamics NAV2017 still limits itself. The active fields in a record cannot take up more than 8000 bytes. The active fields in the Item table take up 12748 bytes.